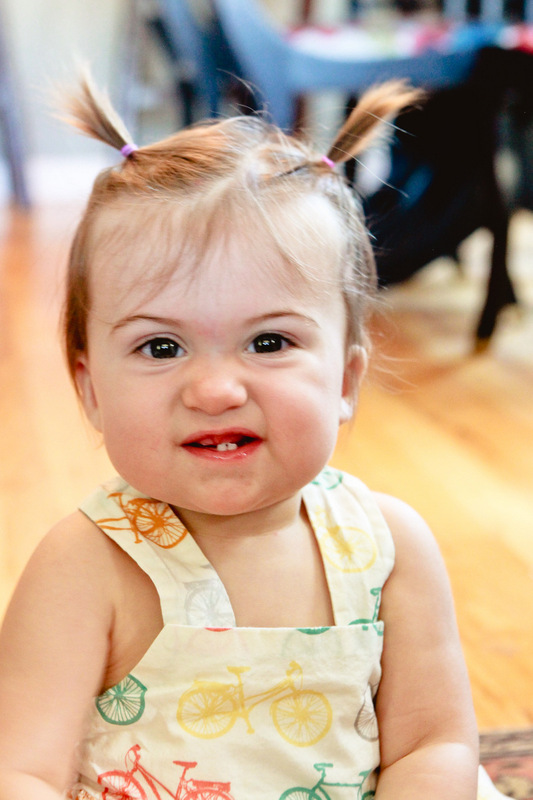 Both Burke and Piper Jane adore our friend from church, Miss Hazel (they tell me a hundred times a day, “Baby Hazel so cu-ute!”). 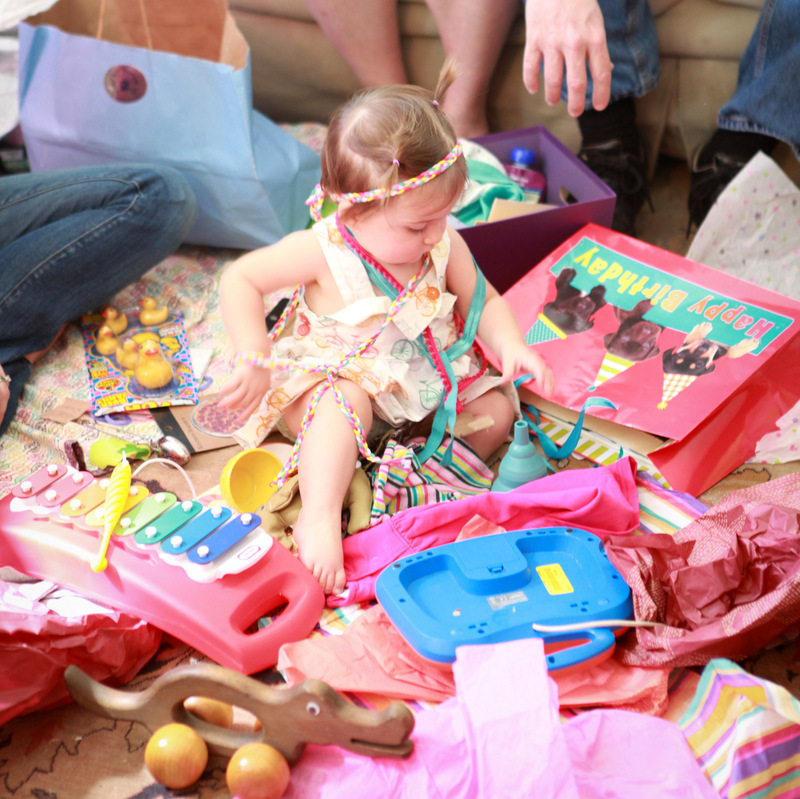 And I love Hazel’s mama, Liz (of retro garden baby shower fame- she was the mama-to-be). 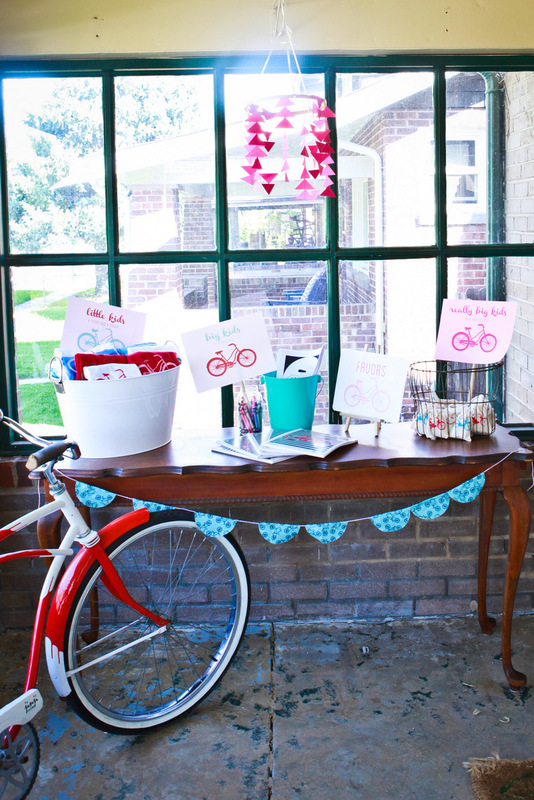 So helping Liz put together Hazel’s bicycle birthday party was a super fun joint venture! As an added bonus, Jord was (unexpectedly) in town for this party. Between Jord taking pictures beforehand and Liz’s uber-talented photographer (Kara Pearson (Gwinn)), I didn’t take a single picture of this bike party, and you still get some serious party eye candy today. 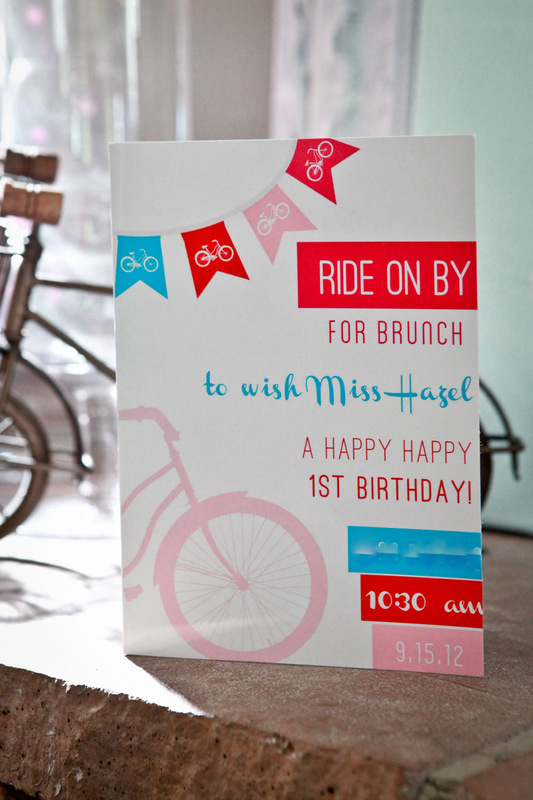 “Ride on by to wish Hazel a Happy 1st Birthday” with red, pink and aqua bicycles. Rounded out with a tower of sprinkle donuts and a pyramid of oh-so-scrumptious Duffeyrolls (if you’re ever in Denver, be sure to stop by this institution of breakfast deliciousness), there was a whole lineup of cereal and milk. 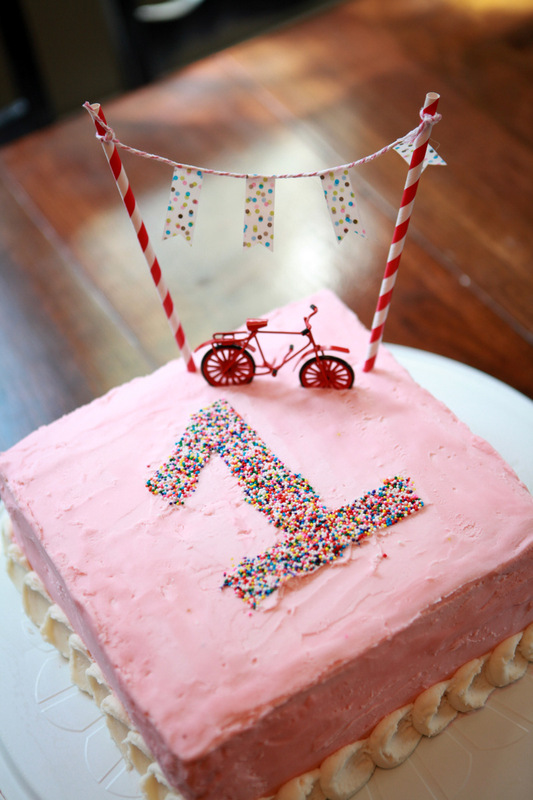 I’m still dreaming about the pink cake (made by our whoa-amazing-baker friend Katie). So good. 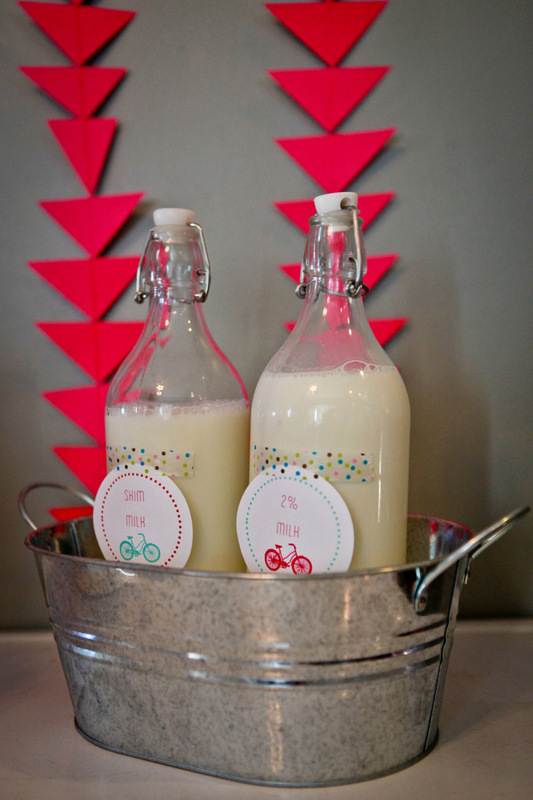 Mini milk bottles, pomegranate Izze’s and coffee complimented the sugar-carb fest. 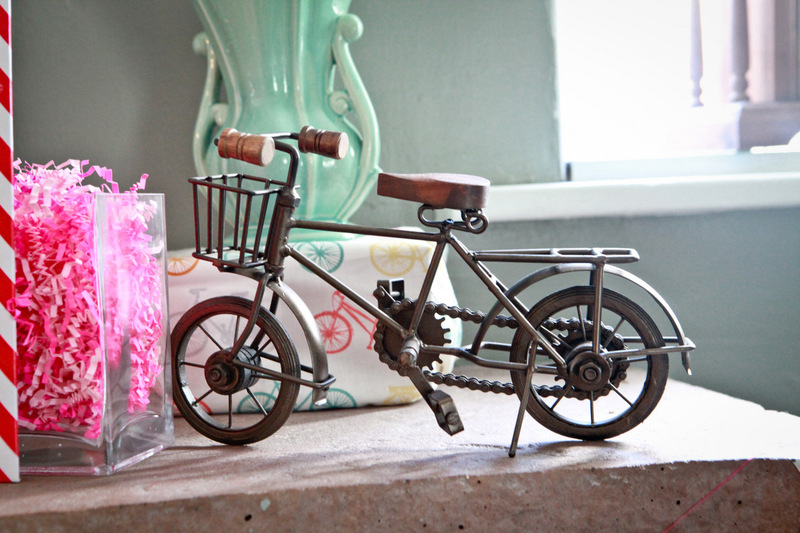 Vintage bikes (one grown up sized and two little Radio Flyer bikes) were the stars of the décor. The bunch of red balloons tied to the back of one of the Radio Flyers was quite the hit with the teeny guests. 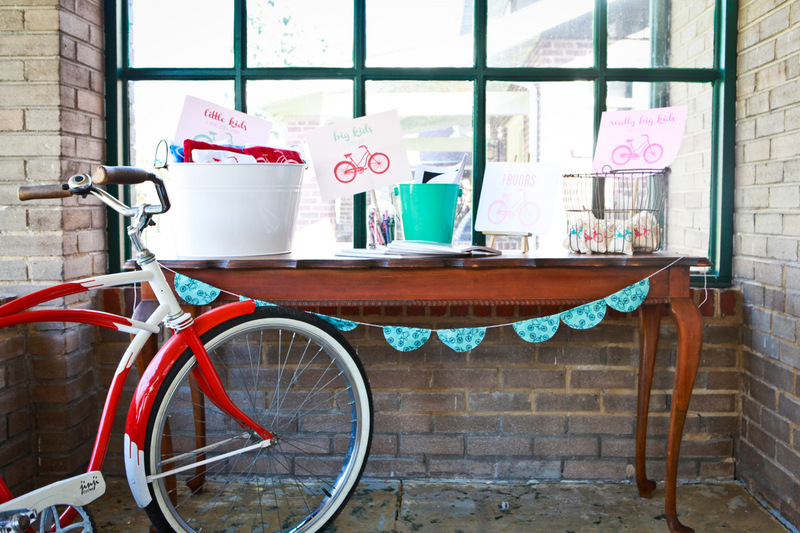 And the bike basket on the vintage bike served as a favor basket as well. 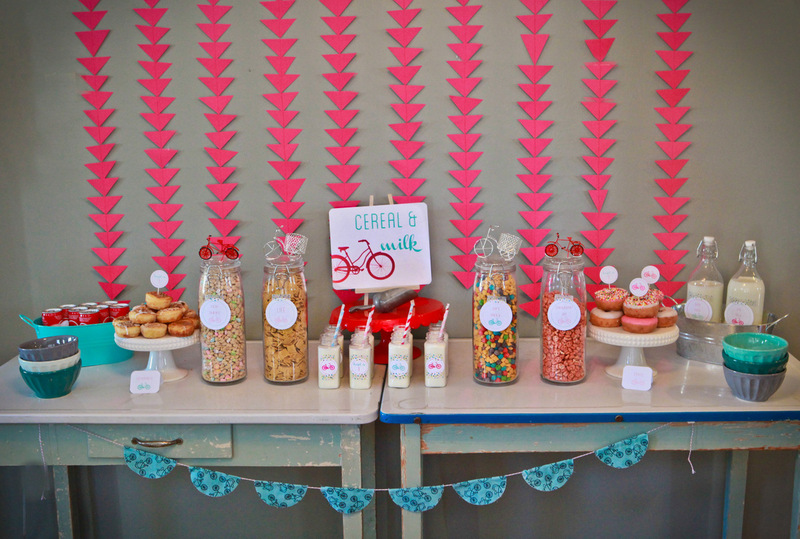 Rows of bright pink triangles made the cereal buffet backdrop, as well as a little pink triangle chandelier for over the favor table. 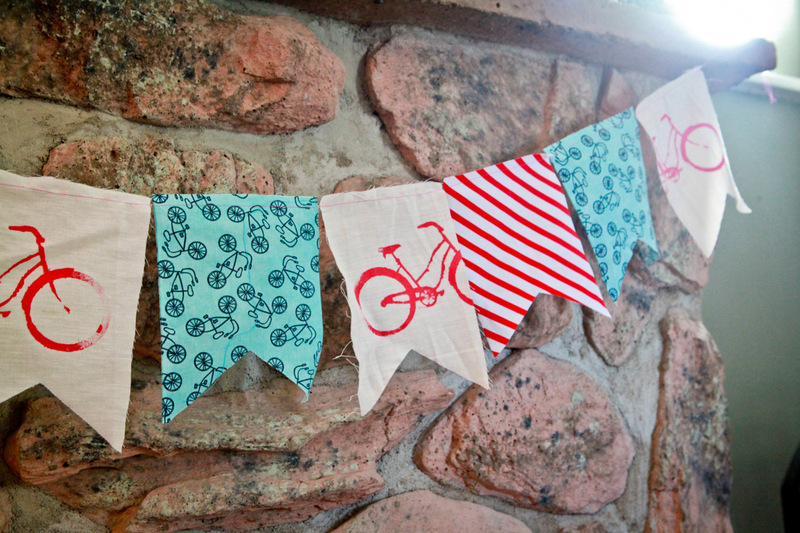 A few buntings added festive flair (two were made from this fabric and the third was a combo of striped fabric, bike fabric, and pink linen screen printed with bikes). 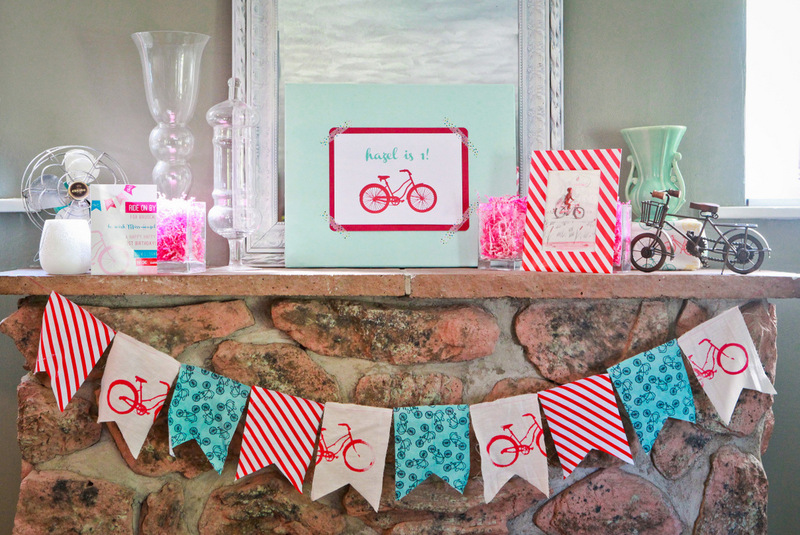 The mantel was full of blue, pink, and red. 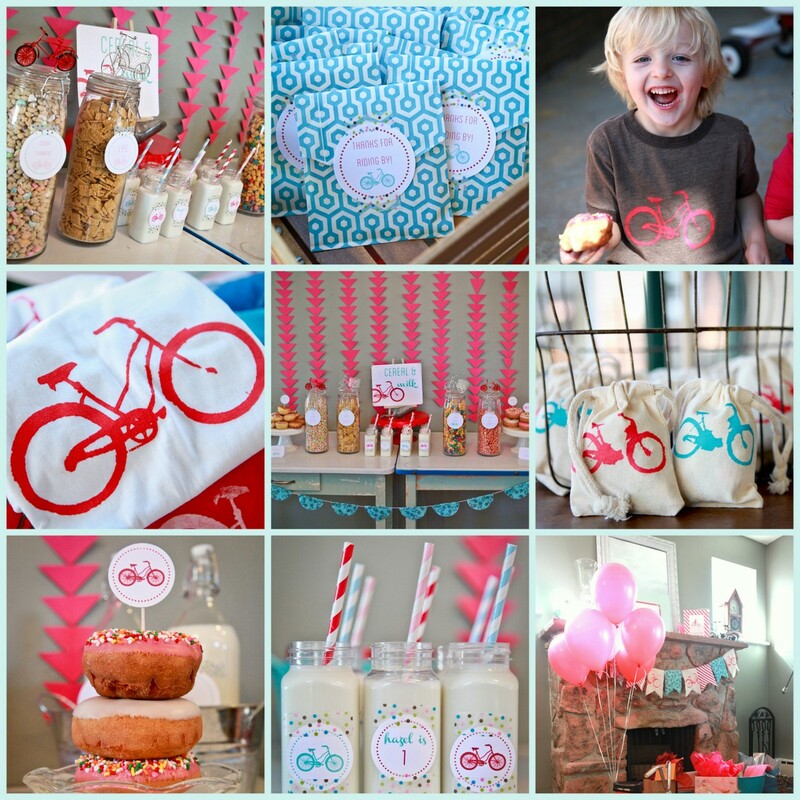 There was a vintage-y bike, a framed Curious George Rides a Bike print (in a wrapping paper covered mat), a “Hazel is 1!” sign, and the screen printed bunting. 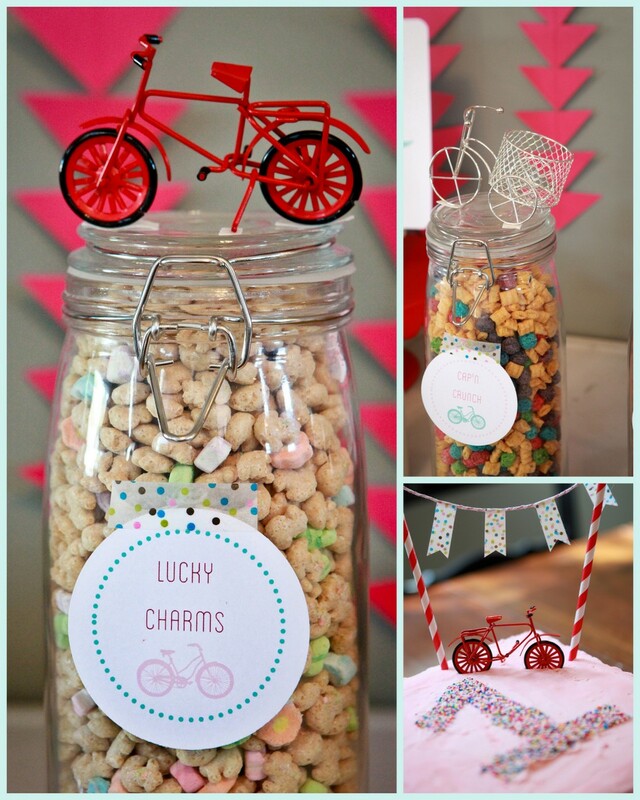 Mini dollhouse bikes topped the cereal jars- the birthday cake also had a mini bike cake topper. 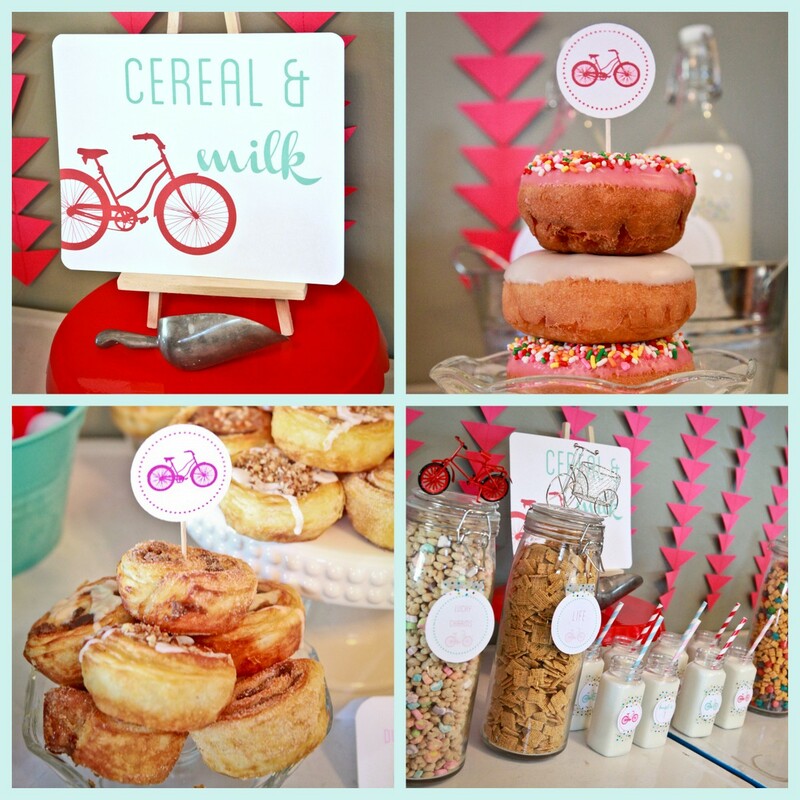 We made the cupcake toppers, the food labels, the favor labels, the milk bottle labels, and the rest of the signage (a “How To Make Party Printables” blog series is in the works- look for Part 1 as soon as later this week!). 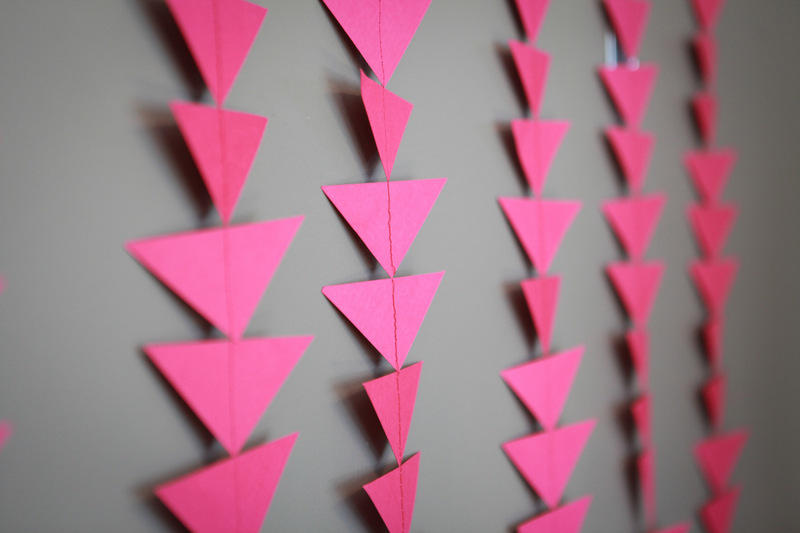 *Updated to add- here is Part 1 of the “How to Make Party Signage” series. We might’ve gone a bit overboard with the favors. 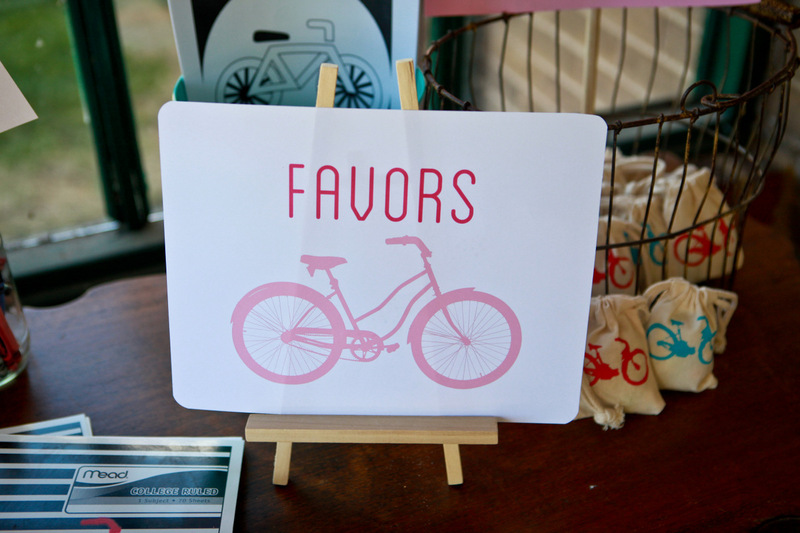 But both Jord and I abide by the “You can never have too many favors,” philosophy, resulting in a porch full of favors. 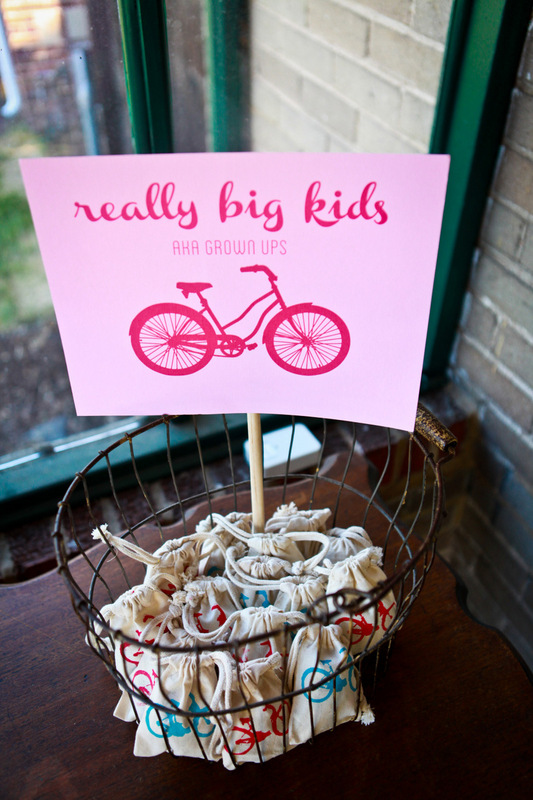 …screen printed onesies and t-shirts for the little kids (we heard from several grown up guests that we should’ve made grown up sized versions as well), screen printed notebooks for the bigger kids, and trail mix (in little screen printed bike bags) for the ‘really big kids’ (aka grown ups, who we really should’ve made shirts for). 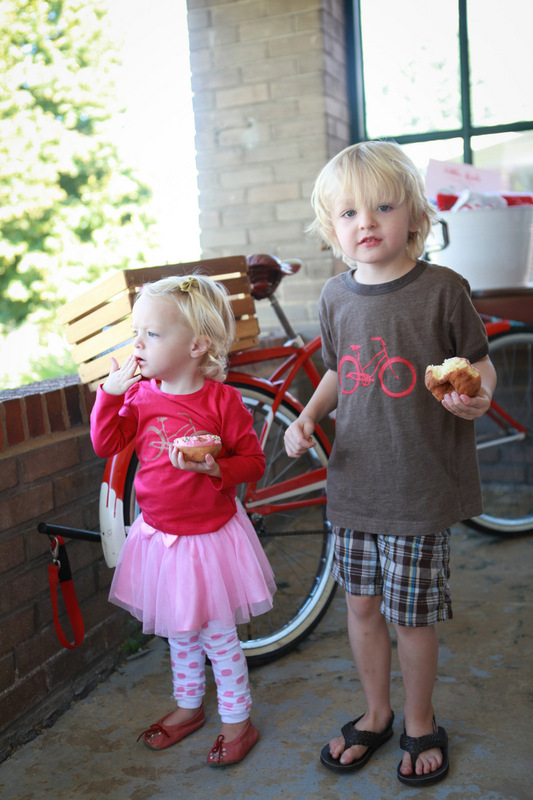 Of course, Burke, Piper Jane and Evie wore their screenprinted bike shirts to the party. They were like walking bike decor. 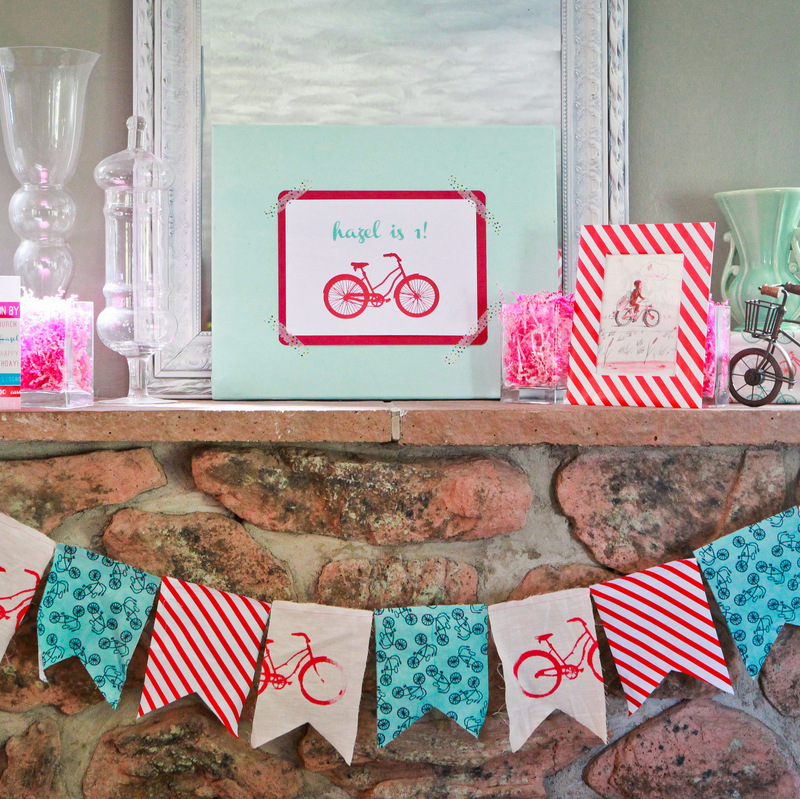 The bike print is by Naptime Diaries (it was our birthday gift to Miss Hazel). 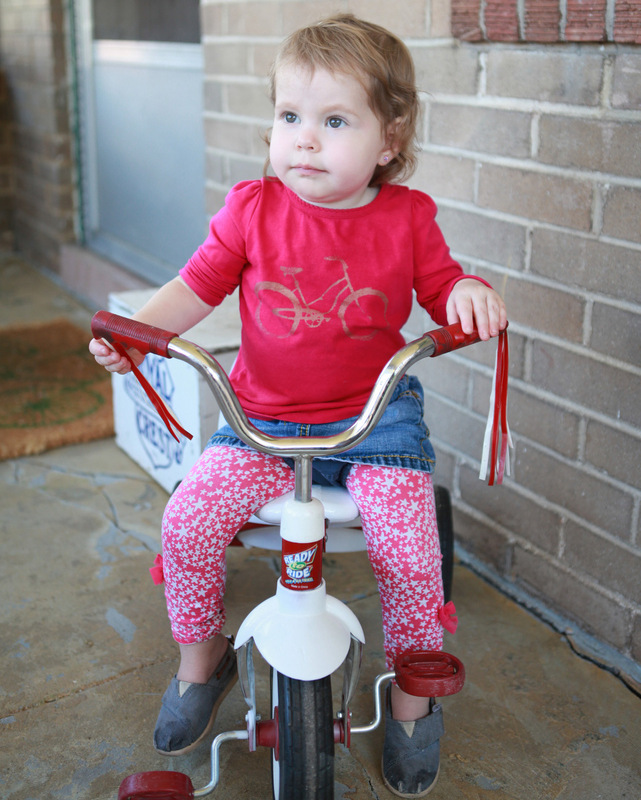 The bike dress was made by Miss Hazel’s mama, Liz. 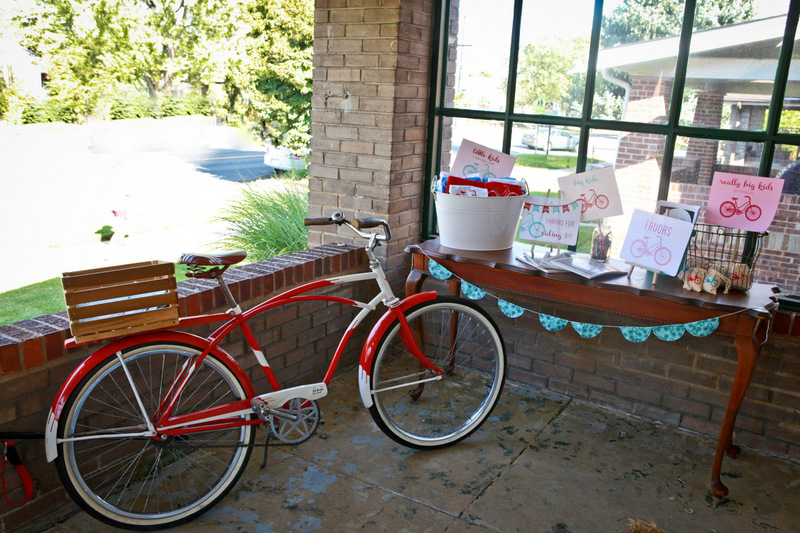 The vintage bike and vintage Radio Flyer bike were borrowed from Jinji Cycles in Denver. 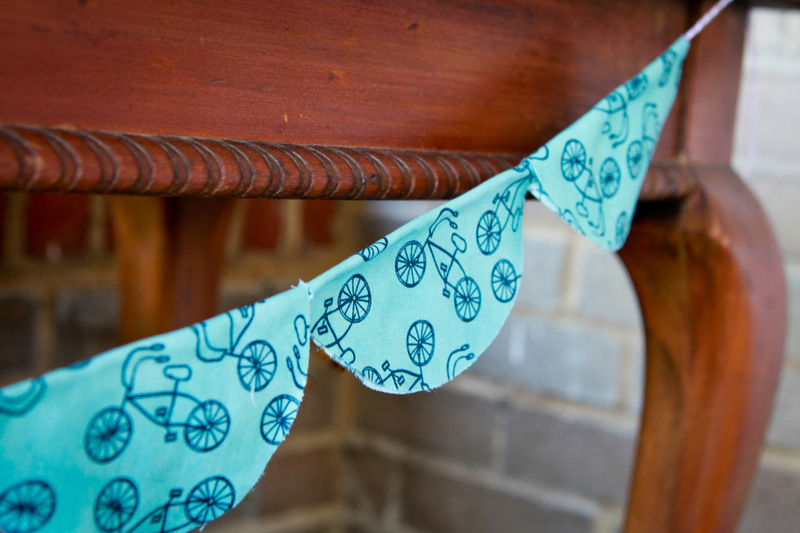 The blue bike fabric is from the line Lucy’s Crab Shack (I ordered it from my lovely sponsor, Southern Fabric). 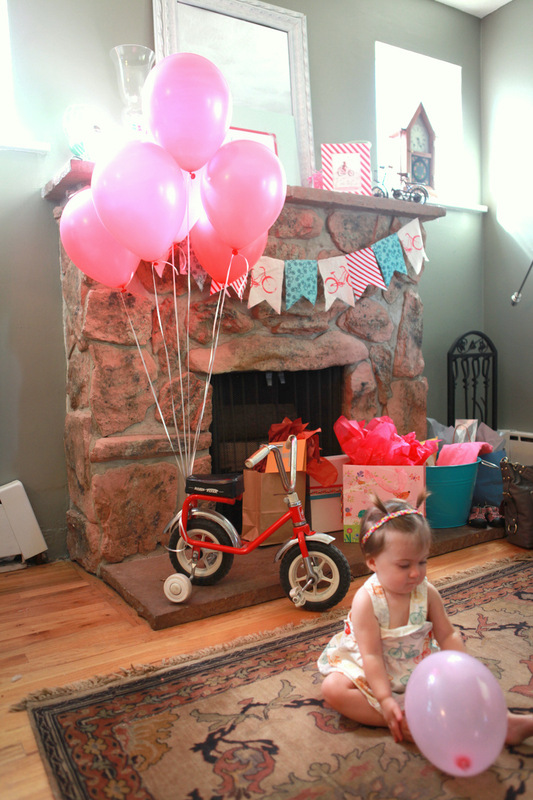 Happy first birthday Miss Hazel- fingers crossed that this party is the first of many Liz-and-Kirstin collaborations! Oh my goodness oh my goodness!!!!! I literally have goosebumps…. And I was there!!! Amazing post- helped me re-live the day!!!!!! Great job friend!!! Haha- you make me laugh Liz! I still can’t believe how early we were ready. That literally never happens. Love your helpful family! wow! That is SO impressive!! Great work. Such a fun theme. I think this is my favorite party you’ve done! I love it. 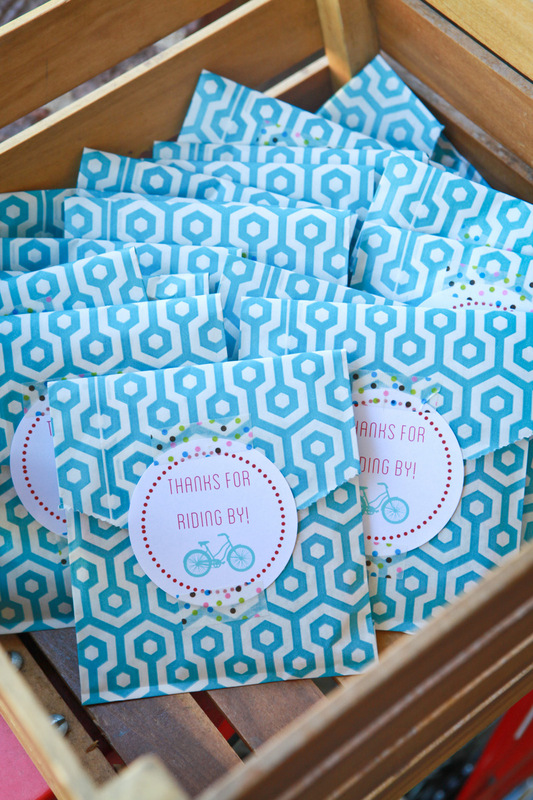 I love how you used the fun tape to attach the labels (super cute). 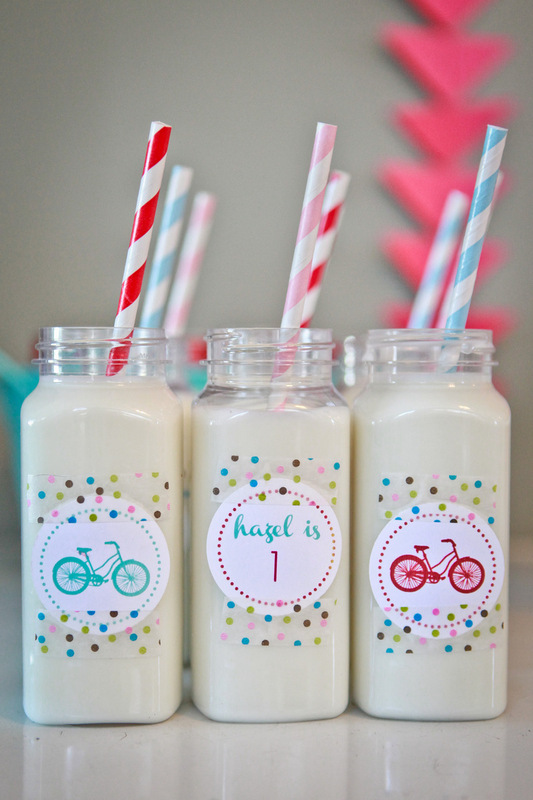 Where did you find the milk bottles? 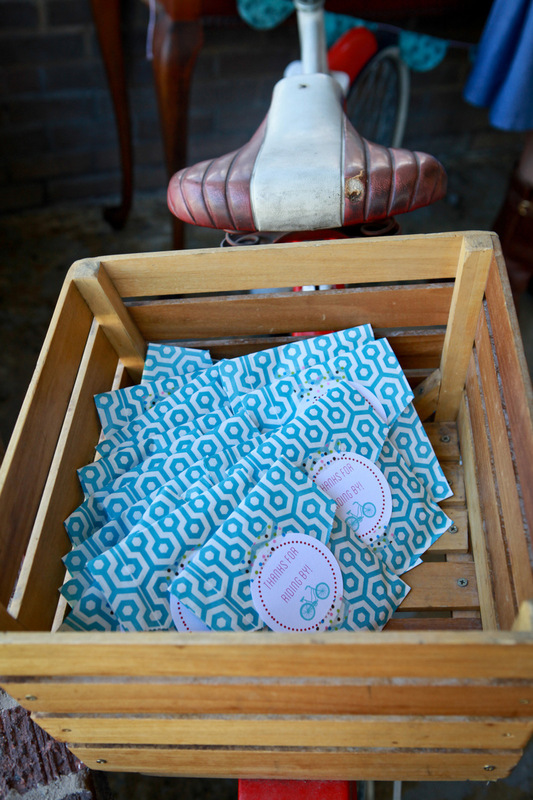 As you can probably guess, I am super excited about the printable blog series! Thanks again for putting that together. P.S. When did Piper Jane’s hair get so long??? She is gorgeous! Thanks Dayna! 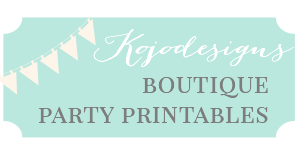 Party printables here we come! 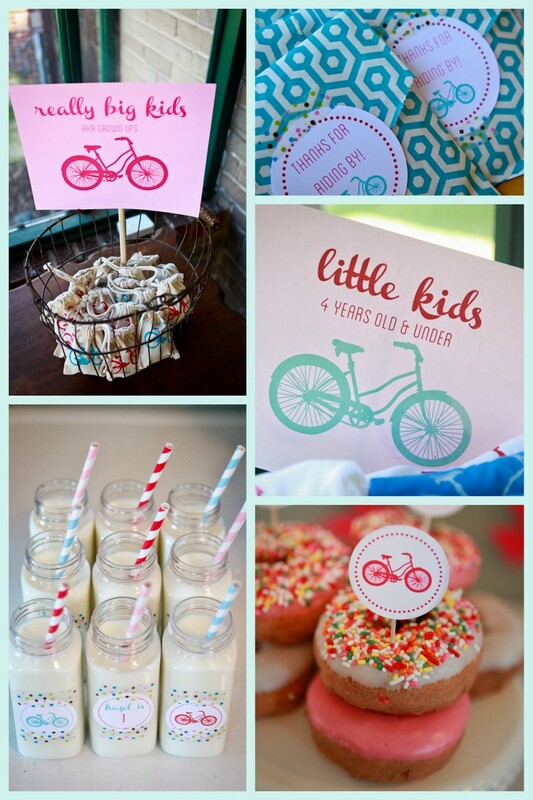 LOVE the bike theme! 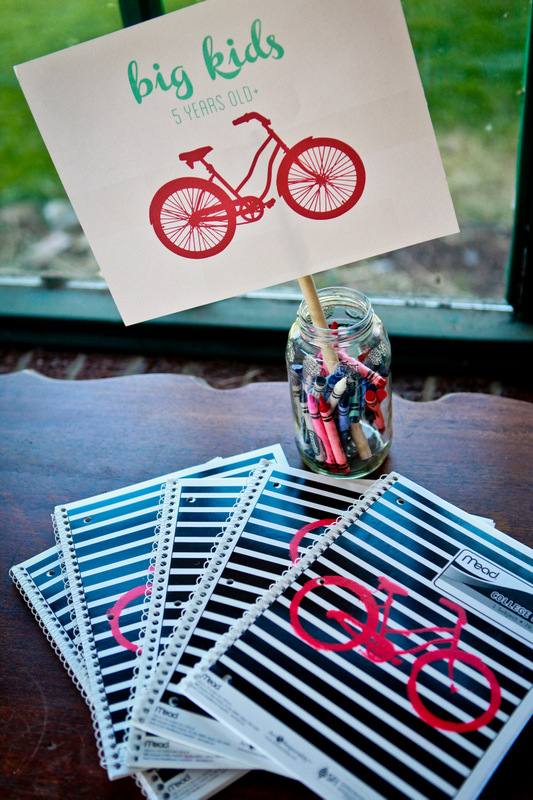 And I think I need some of that bicycle fabric that Hazel’s dress is made out of, do you have a name/source for it? 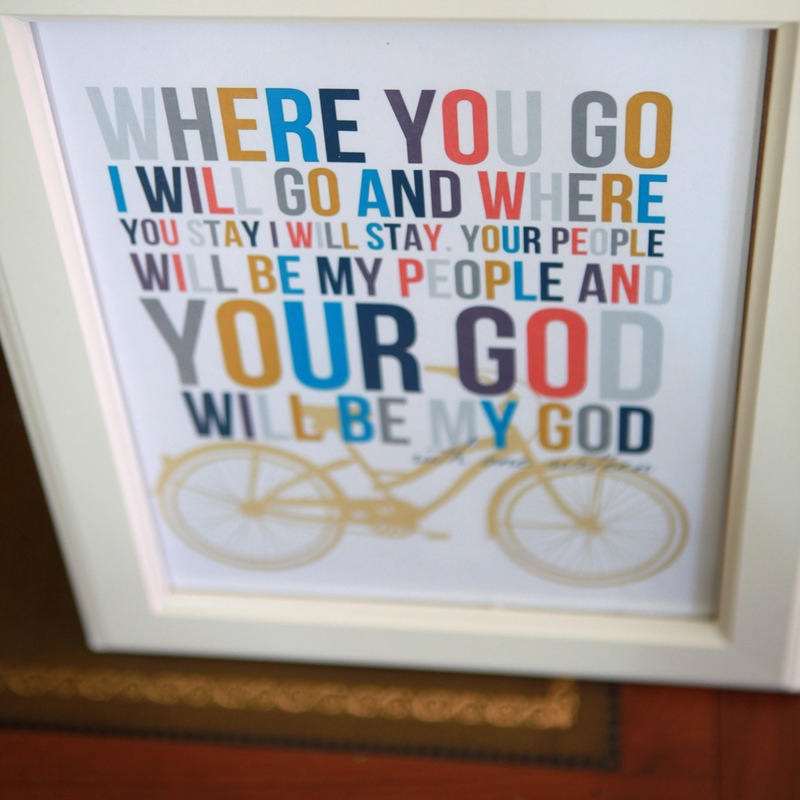 Also, that bike image for the t-shirt screenprint? Flippin LO”VE this!!! 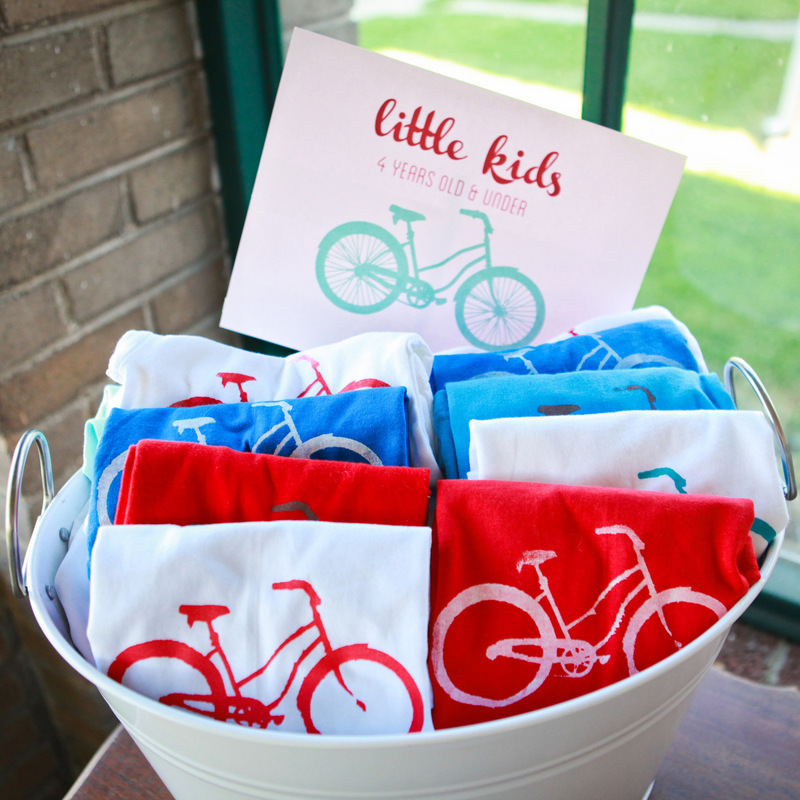 I love bicycles, and I love all the mini bicylces, and the colors and the details…I need help with a soccer party next week–got ideas?!? 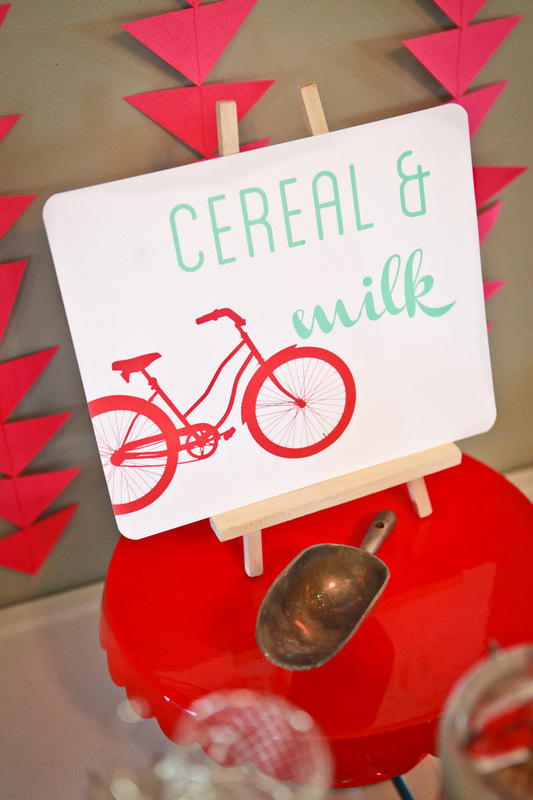 Looked around the web some…pinned this! 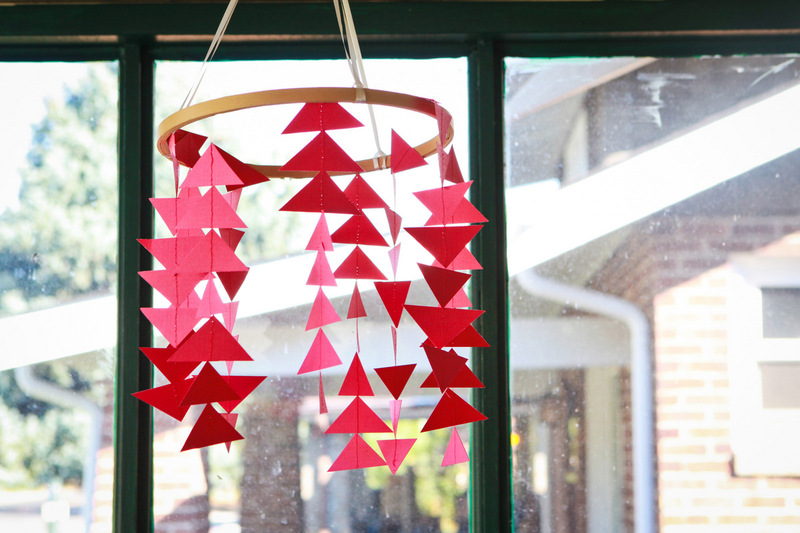 And I will think about soccer stuff (love all the things you could do with black and white or hexagons!) 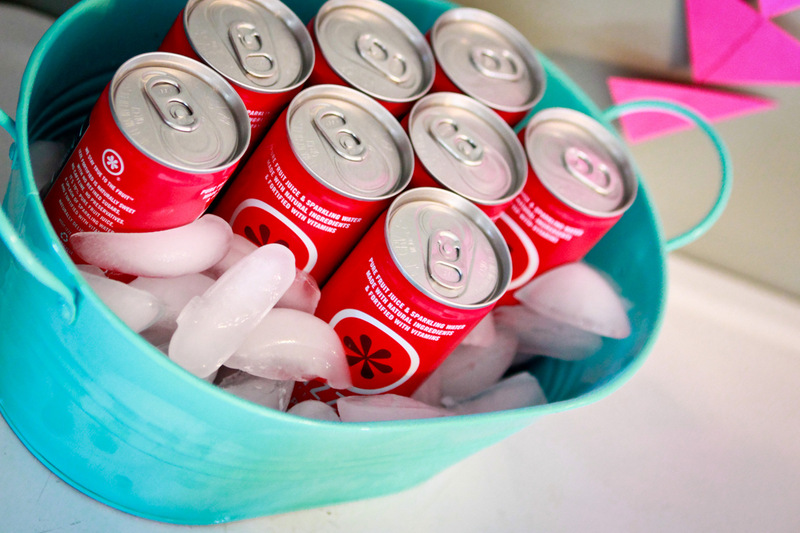 and send ideas your way! This is absolutely adorable! 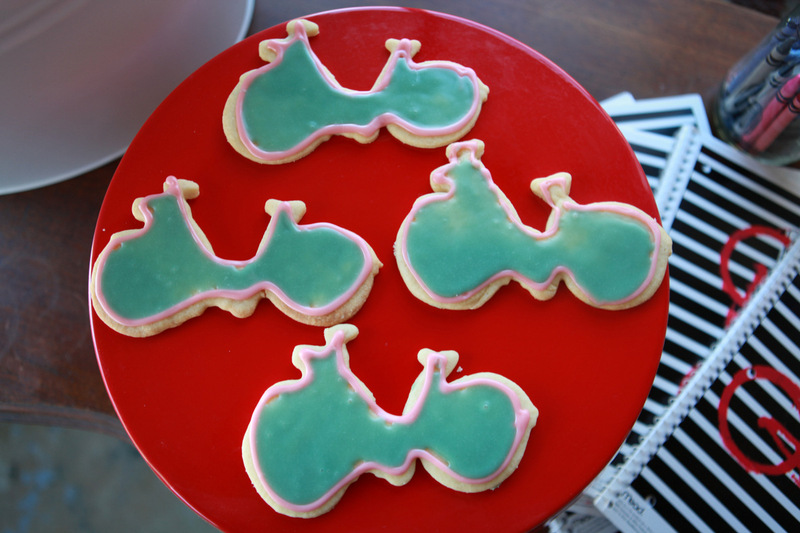 I love love love the bike theme, and my goodness you did such a beautiful job! Hi Kirstin! 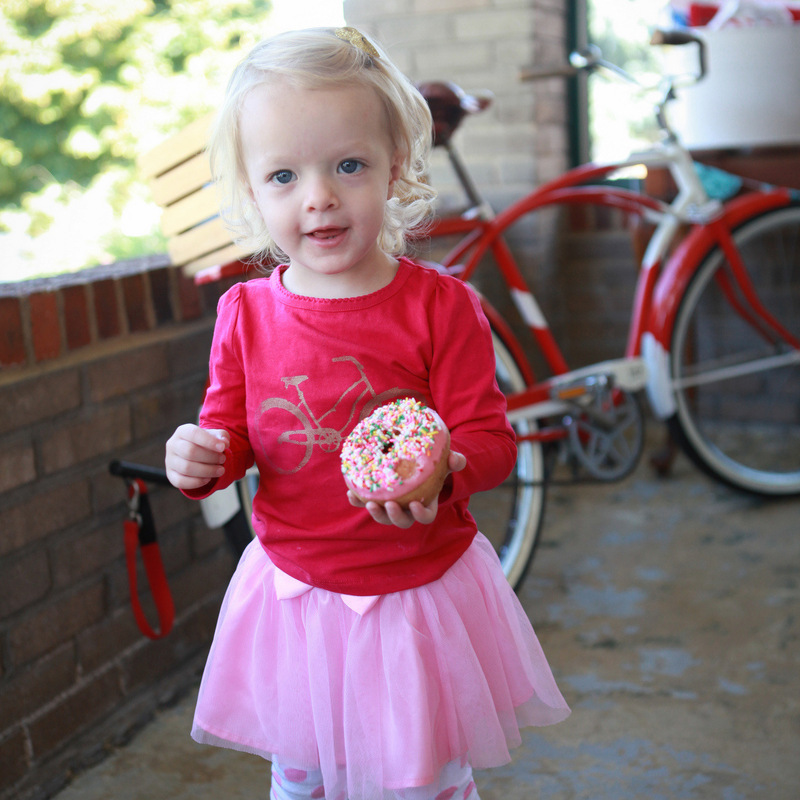 Just had to comment because our little one-year old is named Hazel too! She turned one in September. Just thought it was a funny coincidence. Also, love your blog…nice to “see” you here! That’s so fun Deborah- love the name, and love ‘seeing’ you here too!! !